Dramatic view of the fire that destroyed the Saint-Germain Fair in Paris in 1762. Vue de la Porte de la Treille de l'Incendie de la Foire St. Germain a Paris arrive la nuit du 16 au 17 Mars 1762. This dramatic view of the fire at the Saint Germain Fair in Paris, France was published by Jacques Chereau in 1762. The view depicts the fairgrounds ablaze in the background while townsfolk attempt to douse the raging flames using buckets and primitive water pumps. The Saint Sulpice Church can be seen in the top left. A key along the bottom lists the various locations marked in the view. 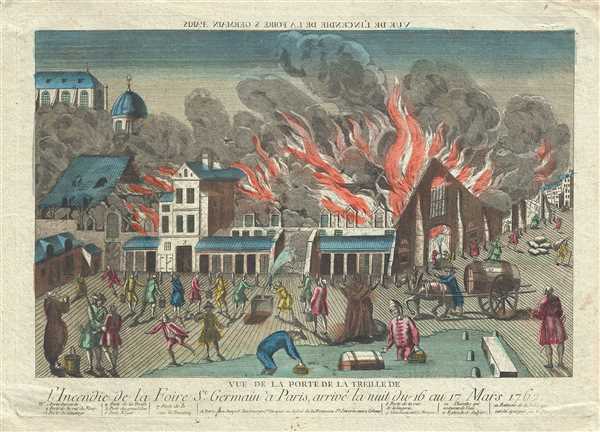 The fire raged for two days, March 16 – 17 1762, and destroyed the Foire Saint-Germain. It would later be reconstructed in 1763. Part of the former fairgrounds are now occupied by the covered Saint-Germain market. The view appears to be an artist’s proof, as the engraving and the title are flipped horizontally. Once flipped back, the title on top would read correctly and the Saint Sulpice Church would appear in the right position. This view was published in Paris by Jacques Chereau. Very good. Original platemark visible. Minor toning and foxing.